Preparing for your big day starts with planning your makeup and hair look. Having some ideas of what look you are going for results in the best success for achieving the look you envision. We are very good, but we are unable to see the vision in your head and we want to make you feel as if we nailed it. Take a look around Pinterest/Instagram and on our social media pages as well. You want to also start thinking about the health of your skin. If you don’t already have a skincare routine at home see your Esthetician, ( or us for 15% off of services) and get on some reliable skincare products and book your facials/waxings/lashes all the way up to the week before your wedding day. We carry and fully believe in the JAN MARINI SKIN RESEARCH Skincare systems. What about your lashes? Thinking of lash extensions? Start by researching reputable lash salons in your area, or book with us and use your bridal discount. ( Offered to our brides only.) Get a sensitivity test done before investing time and money into something that may cause an allergic reaction. We also offer amazing volume lashes for you and your mom/bridal party! A lash lift and tint? This is amazing for keeping your own natural lashes lifted and curled with out maintenance. 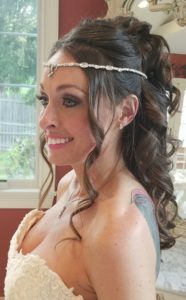 Booking engagement or save the date makeup and hair? Schedule with your photographer and makeup/hair team ASAP. Especially if you are planning this on a weekend during wedding season. ( April – October). it may be hard to get in during those times. What about your bridal shower? And most of all, ENJOY THE RIDE! Part of wedding planning should also be fun, not all stress. Delegate to your bridal party. Ask them to help research vendors, venues etc. This entry was posted in Reviews and Compliments and tagged bridal beauty count down, bridal guide, bridal lashes, bridal time line, bridal to do list, bridal waxing calendar, how far in advance do I book a makeup artist?, planning for the wedding, skincare for brides to be, wedding check list, wedding day prep, wedding planning, wedding planning time line, wedding time line. skincare routine, when should I choose a makeup artist, when to start facials.